Camp Amy Molson is offering kids new ways to get their hands dirty. The 75-year old summer camp near Hawkesbury, midway between Ottawa and Montreal, added a garden element about five years ago. That garden has grown so much, it now provides the camp with nearly 1,000 kilograms of produce each year and recycles 3,000 kilograms of food waste into compost. Campers in an entrepreneurial program have also harvested basil and made 100 jars of pesto to sell to neighbouring cottagers. “What’s been exciting about the farm program is that it has expanded every year” says Dane Savoury, the camp’s director. “In 2014, we added greenhouses. In 2015, we added chickens”. Last summer, the camp took the growing elements one step further: a new one-week program famed Farm, Wilderness and Art Camp was added at the end of August. “I was really impressed that here’s a summer camp that not only serves inner-city youth from Ottawa and Montreal, but it connects kids and their food system,” says Kai Thomas, 24, who won a grant to run the new farm camp program as a pilot project. That program, and a harvest event to which all campers are invited to come back in September to share in the bounty, blossomed so deliciously, they are new favourite elements at the camp that was set up in the 1940s to offer a taste of nature to orphans and children in foster homes. Elijah Qatramiz, 14, has been attending Camp Amy Molson since he was five and was one of 10 who took part in the new Farm Camp last summer. Qatramiz, who says he still likes doing dishes now he’s home in Montreal, learned more than kitchen skills. That boundary pushing even included letting the campers watch two chickens being killed and butchered, then helping to prepare them for their dinners. “That was something we thought a lot about before going ahead,” says Shauna Joyce, the camp’s executive director. “We asked the kids if they wanted to experience it, and none of them opted out,” says Liang Cheng, who founded the farm element at the camp. “A lot of the parents said ‘If they want to do it, great. It’s something their grandparents did, but we never experienced." Fees for Camp Amy Molson are offered on a sliding scale according to what families can afford. See campamymolson.com for more information. The holiday season has long been revered as a time filled with joyful activity, laughter, and giving. Yet, just as Christmas time should be about spreading joy, so, too, should summertime. 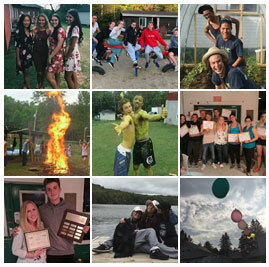 For the past 66 years, Camp Amy Molson has been working to ensure needy youth are not forgotten when school is out. What began as a overnight summer camp for children from foster homes and orphanages has evolved into an institution with facilities for providing more than 150 children and 70 staff with educational and pleasurable two-week summer sessions. Campers age 5 to 14 are billeted in cabins on a 180-acre lakeside site near Grenville, across the Ottawa River from Hawkesbury, Ont. Everyone follows a regular schedule, rotating through six periods a day that feature arts and crafts, music, drama, nature lore and sports. The two-week summer sessions are highly valuable to kids who might otherwise be stuck in the city bored, uninspired, and at greater risk of getting into trouble, says Shauna Joyce, executive director of Camp Amy Molson. "Throughout these two weeks, we use teachable moments to educate these kids and build up areas where development is lacking," she said. "A lot of families coming from poverty have deficits in areas like health and problem solving. We try to address these lifestyle disorders." 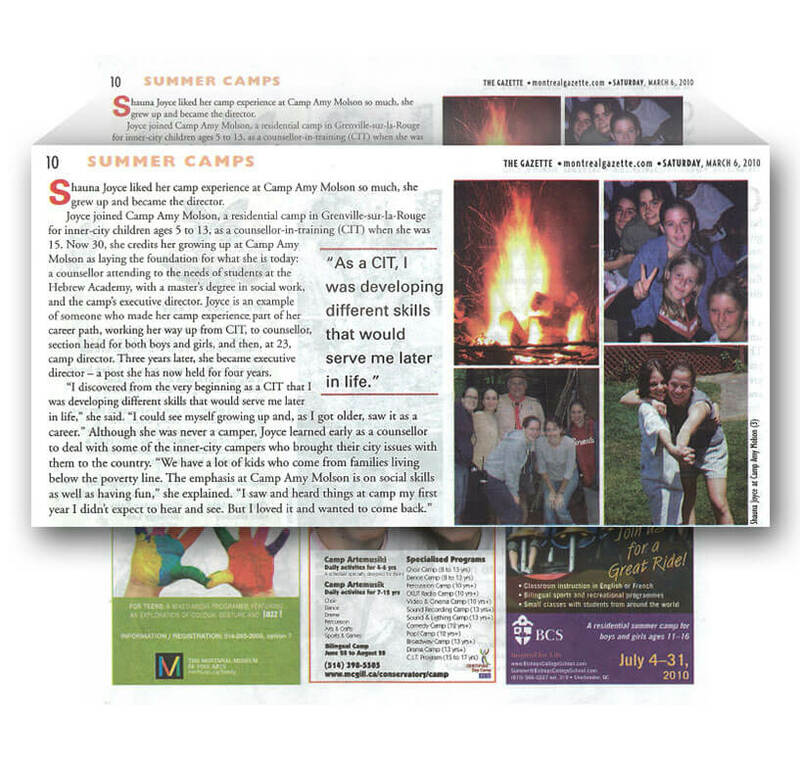 "There have been many success stories as a result of our campers' experience here." "Some of our kids come from foster homes, so it is their only chance to spend time with one another as a family," she noted. "We try to actively get kids from the same family to spend these weeks together." Fifty families from Camp Amy Molson will be among the thousands of people in the Montreal area who are to receive $125 cheques from The Gazette Christmas Fund this year. The money helps make the holiday season a bit more cheerful for the needy. The families Camp Amy Molson has selected for the extra money face a wide range of difficulties, Joyce says, but each shares a tremendous gratitude and appreciation for the help. "One family is suffering from domestic violence, while another is coping with a heart problem and the wait for surgery. There is also a family with a young mother going to school and a young father with four boys at home," she pointed out. "It is always so rewarding to offer help to families who are so appreciative. Often there are tears. Some of our families are selfless enough to tell us they know others who are in greater need than they are. "It is amazing to see how thoughtful people can be. I am just so happy to be a part of this." Nico Trocme, the featured speaker at a fundraiser for Camp Amy Molson this week, admits he doesn't know a lot about the place that offers fun in the sun to inner-city kids. A professor of social work hired three years ago by McGill, Trocme, 48, is still learning about Montreal's large and far flung network of social agencies and institutions. But he likes Camp Amy Molson sight unseen because Trocme thinks summer camps are immensely important for disadvantaged children. Three summers working at a camp for underprivileged kids piqued Trocme's interest in social work. He saw, at first-hand,• the value of "skill development and a lot of emotional. support." Helping those who need it most was the original purpose. Trocme told me the first summer camps were created by 19th-century benevolent agencies to get the poorest of New York's children out of their steamy tenements. "You know a program- is good," Trocme said, "when it gets taken over by the middle class." The bourgeoisie co-opted an altruistic idea and began adding refinements. The contemporary cornucopia of summer camps offers everything from archery to zen. Camp Amy Molson fulfills the old mandate of giving• urban kids a bucolic break. The 73- hectare camp is in Grenville-sur-la-Rouge, across the Ottawa River from Hawkesbury, 100 kilometers northwest of Montreal. It was founded in 1944 by Montreal's Ladies Benevolent Society and named for the Molson family member who donated the property. This summer, 150 Montreal children between the ages of 5 and 14 will attend each of three two-week sessions at Camp Amy Molson. Most campers are from families whose incomes fall below the poverty line, and 20 per cent of the kids are under Youth Protection. "I'm always impressed by the resilience of children, their ability to feed off positive aspects of their lives,"
Summer camp can be "an incredible anchor" for children whose families are dealing with poverty, mental illness, substance abuse." "Camp can be a haven of success and positive relationships," he added .. "It's a place where you're not constantly being singled out as the bad kid in class. Maybe your reading difficulty doesn't get in the way when you're learning how to canoe or build a campfire or work hard to earn your. swimming badges. The kids work hard and focus on a real skill." Fresh air is beneficial to anyone's health. Summer camp, Trocme says, is particularly valuable for the mental health of needy children who build friendships and a sense. of belonging. "Camp can be very powerful," he said: "It's a very important protective factor for kids who are facing adversity." Trocme's office is in Morris Hall, at the corner of University and Prince Arthur St. It is decorated. with moody, black-and-white photos of Paris, .where Trocme was born. He came to North America in the mid-1970s to study at the University of Toronto. Trocme joined the McGill faculty as the Phillip Fisher chair in social work. His focus is on families. His office is decorated with toys, action figures -things that make children happy. His expertise is what makes them sad. Trocme's research focuses on child abuse and child neglect. He is the director of the Centre for Research on Children and Families, drawing faculty primarily from the school of social work but also nursing, law and psychiatry. At a Wednesday evening cocktail fundraiser for Camp Amy Molson at Maison Alcan, Trocme will talk about children at risk and community-based activities to combat child abuse. "It's a powerful term," Trocme said, "and at times I wish we had better words than 'child abuse' because .it pushed us toward thinking the best thing to do is involve the authorities. Reporting has to happen, but what comes with that often is turning our backs on the problem. There's not much the authorities can do without support from the community." Trocme would like to see social policies geared toward combating mistreatment of children "at the grassroots level- things like summer camps for high-risk kids are absolutely critical." Not all children have the chance to enjoy fresh air, outdoor activities and sing-a-longs during the summer, but Camp Amy Molson is dedicated to changing that. Costs for the residential camp operate on a sliding scale, rising up to $480 per two-week session, to allow underprivileged children to attend. Executive director Georgina Ricard said the actual cost is $700 per child and the provincial government and Centraide fund the camp. Remaining costs are covered by donations. We’re always in need of money. We’re always in deficit, she said. The Grenville, Que., camp was founded in 1944 by the Ladies Benevolent Society, thanks to money donated by Amy Molson. At the time, it welcomed orphans. Today, 150 campers aged four to 12 and 70 staff members attend. ‘We have really good role models. It’s something I think they remember for years.’ Jelani Lattimore, 11, of Pierrefonds, has been attending Camp Amy Molson for four years. He said he looks forward to it every year. ‘(Yesterday), I did swimming, baseball, pottery. . . we had lunch then we had cabin choice,’ he said. Cabin choice allows the children to decide what they want to do, so the boys chose to practice a dance routine they later presented to the rest of the campers. Pincourt resident Amanda Fairchild, 11, stays in touch with her camp friends during the year. She loves the camp and hopes to eventually become a counselor, she said. Carroll sends about 600 children to camp each year, but another 100 are on a waiting list. She blames lack of government funding, which she said has not changed since 1992, while have doubled. Pointe Claire resident Shauna Joyce feels she has helped many children during her seven years at the camp. However, her first year was difficult emotionally. She recalled being on night supervision and comforting a seven-year-old boy with recurring nightmares. ‘He had seen his father get shot that year and he talked about it very easily.’ Being a counselor is very rewarding, Joyce added. To contact Camp Amy Molson, call (514) 484-9919. Camp Amy Molson is a affordable sleepaway summer camp for Montreal children, aged 5 to 14 years old. 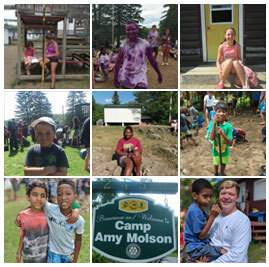 Camp Amy Molson offers 3 sessions of 15 days each.